Welcome to the HAMster Weak Signal Group Lunch and Learn. The purpose of this event is to bring a large group of HAMs together for some education and fun. We want to introduce you not only to the HAMster Group, but also to VHF/UHF Dxing. If you have never experienced the trhill of working stations on 2 metersa nd up 500, 1000 or even 1,500 miles, with daily contacts in the 100 to 150 mile range, then come join us. 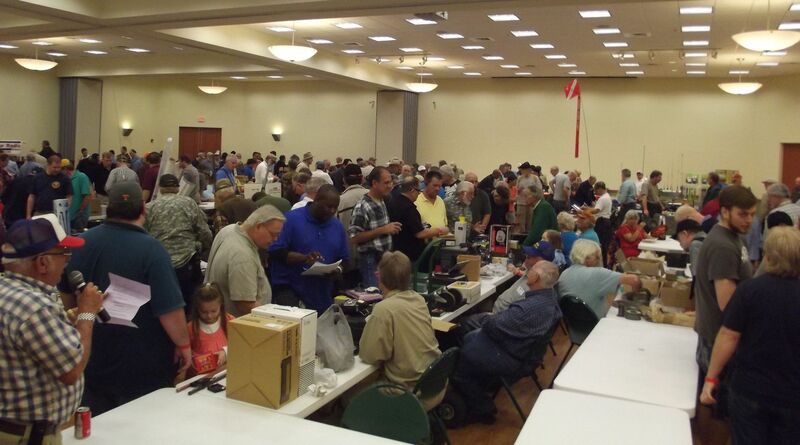 Join us for Hot Dogs, Chips, Soda and VE Session with VHF/UHF training classes. Special Weak Signal Training by FLEX Radio, and the HAMster Group. Flex Radio will be on hand to demonstrate the new products and advantages for VHF/UHF Weak Signal/EME/Meteor Scatter. License Testing available for new hams or upgrades to your license will be held at 2pm. $15 per test taker. Please contact Pat AD5BR at HAMTEST@GMAIL.COM for details and to RSVP for the test session (not same address as used to register for the Lunch and Learn). Test Session this coming Saturday at 1000 at our new location. 424 Castell St, New Braunfels, TX 78130. Driving up Seguin St (fm725) towards the circle turn left at the Civic Center and the street that runs behind the Civic Center is Castell. The new Fire Department Training Facility is now located on Castell right behind the Civic Center in what used to be the Municipal Offices for New Braunfels. Park on the left side of the building in what is labelled as Employee parking and enter the building from that end. Test Session will be as usual starting at 1000, all classes of license will be tested. The fee is $15 payable by cash, check, or money order. Please bring your drivers license or picture ID and ur amateur radio license or any CSCEs you may have. Looking forward to seeing you there. If you have any question please contact K5GST (GaryT) at k5gst01@ gmail.com. The next regularly scheduled GVARC sponsored test session will be held on 22 Nov 2014 at the New Braunfels Fire Dept Training facility at 1311 Industrial Blvd, Suite A, New Braunfels, TX 78130 at 1000. Come one, Come all! You don’t need an appointment. Walk Ins are allowed. Bring your original license with you if you have one and preferably two copies, however, we can usually make copies on site if we need to. Last time in Sept there was a problem and since I leave the copy tasks up to Darren/WD5GQT I will have to check with him to see if the problem has been fixed or is fixable before the 22nd. Also bring two forms of ID, here we usually get your drivers license and in the Texas of Today your CHL is usually the number two choice. If you are not licensed to carry I can accept many different forms of identification as a second ID. I have had to resort to using a birth certificate as the only means of ID before so if there is a question in this area please contact me. I can afford to be somewhat liberal in this area. If you are a first timer testing for a new license, bring your ID and we will take care of the rest. As always one test will costs you $15 and if you pass that one you can take the next test in the sequence without paying a second time. If however you fail an element and wish to take it over using another version of the test we have on file you would need to pay another $15. Usually that isn’t a problem. This is also a call for certified ARRL VEs who can help out. Please drop me an email if you can help so I can plan accordingly. The next regularly scheduled GVARC test session will be held on January 4th, 2014 at the New Braunfels Fire Department Training Facility located at 1311 Industrial Drive Suite A, New Braunfels, TX 78130. The session will begin at 10:00am and conclude at 2:00pm, or when candidates stop arriving. Two forms of identification – State issued ID card, plus something like a CHL, school ID, passport, etc. Your currently held license or CSSE — if you have one. Note: This is strictly a testing session. No test material will be taught or reviewed. The VE team will be monitoring the 147.000 repeater if you need any assistance in finding the testing location. Please contact the GVARC VE Team if you have any questions. 2013 Field Day Is Just Around The Corner! – Who’s Doing It & Where? I’m currently compiling a list of clubs or individual stations who are making plans for Field Day 2013. If you want me to share your location and hours of operation (some clubs don’t run full 24 hours, and/or shut down during the night and resume in the morning), please send an email to info@sanantoniohams.org with “Field Day 2013” in the subject line to get my attention. Please include any details you want shared, such as a talk-in frequency especially if you are on private property or a hard to find location. Let us know if there are any admission fees (such as operating from a public or private park, etc.). If you require RSVP, please provide the official contact info for that purpose. If you are limiting the hours of operation, such as taking a recess during the middle of the night and resuming the next morning, let me know that also. I know you don’t just want folks to show up for meal time, especially if they aren’t a member of your club. After sifting thru the thousands of emails on my computer, I also visited the ARRL official site locator page to see what I could see. And then I looked for San Antonio / Central Texas area on the map, and said “double wow!” I know of several clubs not shown on this map, as of today as of 06/11/2013, who plan on conducting a FD event. Click on the screen shot to the right for details. 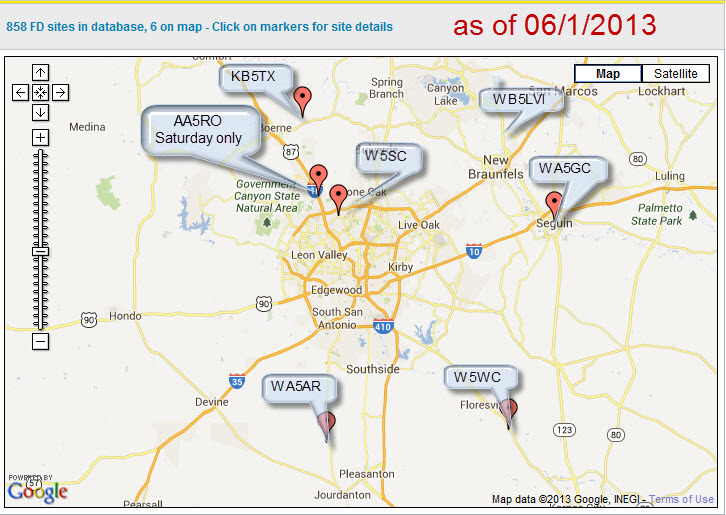 The little red map parkers are those FD locations registered as of 06-01-2013 with ARRL. The little comment boxes are the locations that I’m aware of, where clubs are planning their event. I’ve added some event stations below, from Bandera, San Marcos, Austin, Kerrville and Corpus Christi, that do not show up on the San Antonio metro map image that I posted here. SARC will be conducting a VE Test Session at 10am on June 22nd, at the Great Northwest Library off Grissom Road & Timberwilde Rd on the NW side of San Antonio. This is their normal date / time / location for such test sessions. Contact Pat AD5BR at 210-273-5927 or hamtests@gmail.com for info. Pat will have FD information available that morning for the new hams to go visit afterwards. GVARC will be conducting a VE Test Session sometime during the day on Saturday, June 22nd, at the site of their Field Day. See location info listed below.